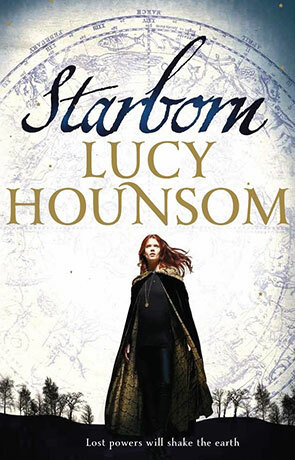 An exciting new high fantasy story in a new fantasy world, Starborn is Lucy Hounsom’s debut novel. Her graduation to UK Tor’s writing stable from an MA in Creative Writing and before that a BA in English and Creative Writing speaks for itself as being quite an illustrious journey towards the promised land of publication. Starborn is certainly a strong and engaging start. It is a novel aiming squarely at the young adult and immediately invokes elements of Terry Brooks, Trudi Canavan, and Melanie Rawn. We’ve airships, untapped power and magic that involves weaving the power of the sun and moon. At the centre of this is Kyndra, a young girl trying to learn what fate has in store for her on her coming of age day in the frontier village of the Vale. In fact, many names feel familiar, playing on our memories of their variations. Whilst some of the writing feels familiar, Hounsom’s use of characters is quite unique. There is an inscrutable quality to them in places that makes you unsure of what might happen next. In part this comes from the way she uses her peripheral cast, dwelling long enough on some to make you think they will play a bigger part than they do, whilst the motivations of others remain concealed from the reader so that they pop back up at intervals when you least expect them. The story moves along at a brisk pace and our main character grows up as she travels and realises that people make their own fate. Her companions Brégrenne and Nediah prove to be an interesting mix of knowledgeable guides, obstacles and mysterious allies. Brégrenne is particularly well drawn, proving to have more depth to her than you realise at first. Later she takes up the viewpoint as well. Nediah is perhaps a less detailed character by comparison, although his straightforward nature engenders more sympathy. A few narrative choices remain unpredictable. Parallel stories running at the same time from different perspectives are perhaps unnecessary as they make the reader ‘wind back’, although you can see the reason behind this as Hounsom endeavours to make you aware of the bigger political picture at Naris. By contrast, some of the events don’t play out as you think they will, which serves to heighten your interest in where the story will go. Kyndra herself displays all the flux you might expect from a young person unsure of what direction her life may be taking. She does not exhibit the powers others expect to manifest from her latent abilities, but her denial of having any magical gift is constant in the face of evidence and makes her a frustrating character. The clue might be in the title of the book and perhaps that telegraphs the reveal a little too much. As events converge towards the ending, the prophetic tone and lack of answers to Kyndra’s questions become something of a constraint. At the moment, this is not a girl learning to master her hidden nature and thereby becoming a woman, this is a girl plagued by her nature, stripped of choices and power to shape the events around her. When the true circumstances are finally revealed, the complexities of the plot untwist themselves and we find the resolution not as simply as we thought. The high fantasy premise sets up a magical conflict of detail and colour tempered by consequence, which would certainly appeal to young vivid imaginations. Starborn is a good read and promises much for Hounsom’s future writing. My preference would be to see future books in her Worldmaker trilogy let off the leash of following one character’s journey and delve into the wider politics of Mariar, its reverse and Acre, but she’ll tread her own path and so she should. The writers before her inspired a whole generation of children to imagine their own worlds and ideas. Hopefully Starborn will do the same. Written on 10th May 2015 by Allen Stroud.